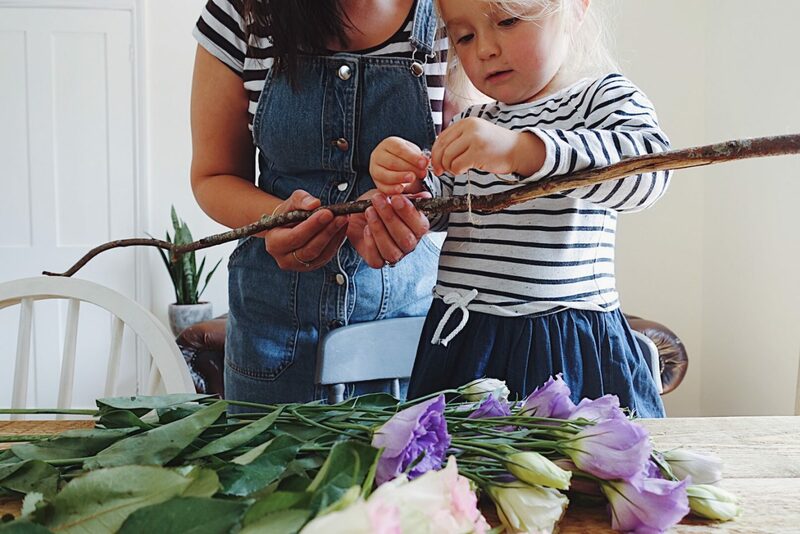 I am going to put a big fat disclaimer at the beginning this this post and say that making this flower decoration really isn’t rocket science. I mean, you could totally work out how to make it yourself. That said, I really enjoy making things like this, so I thought I would tell you how I made mine. 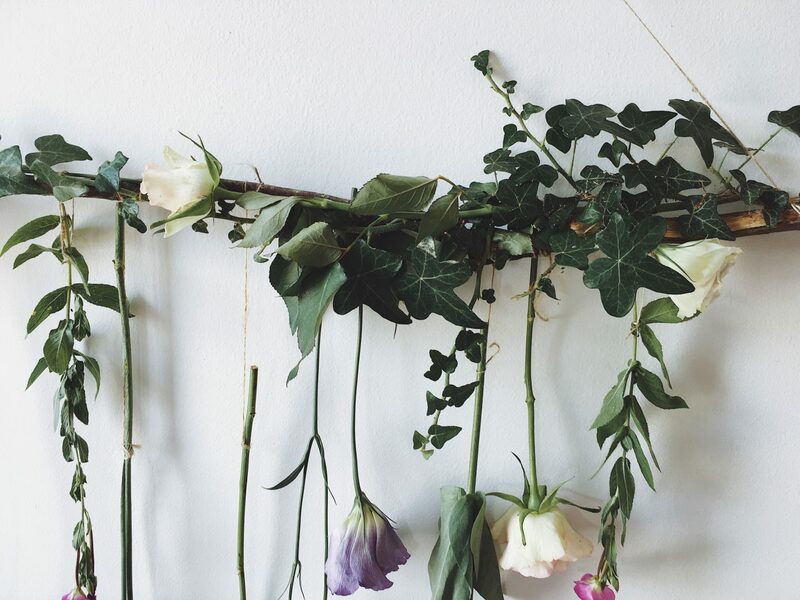 I use them as a pretty backdrop for Instagram photos, but you could use them for parties, weddings, whatever really. They’re not particularly practical, but they are pretty. A branch – the one I used here was reasonably straight and about a metre in length. Twine – I used a jute string, which works well because it fits with the rustic/natural feel. I would love to have made mine using some big garden roses, but sadly mine were all long gone by the time I came to do this. You could use any flowers to make this, and in the past I have used a few herbs for an extra bit of green. Anything goes really. 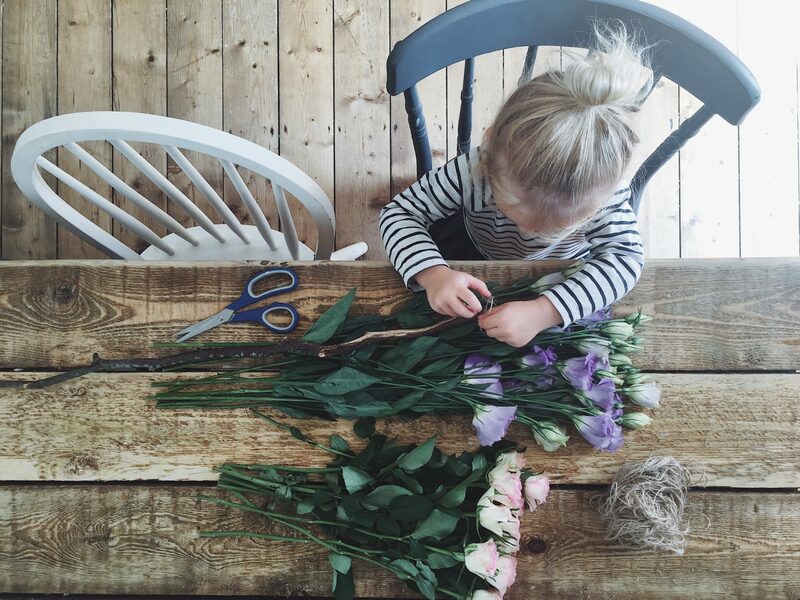 To get started, I cut a few lengths of twine to different lengths and began tying them to the flowers and then to the stick. 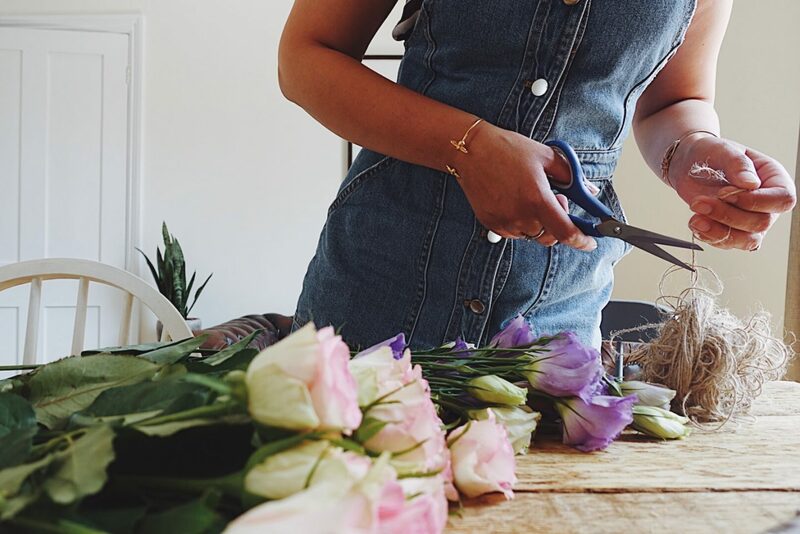 I cut the stems of the flowers to different lengths to make it easier to hang them at different heights. I found that resting either end of the stick on two dining chairs, helped to make this bit a little easier. Once I was happy with the number of flowers in the arrangement, I began wrapping ivy around the stick to make it a bit prettier. I used smaller lengths of twine to secure it as I went along. 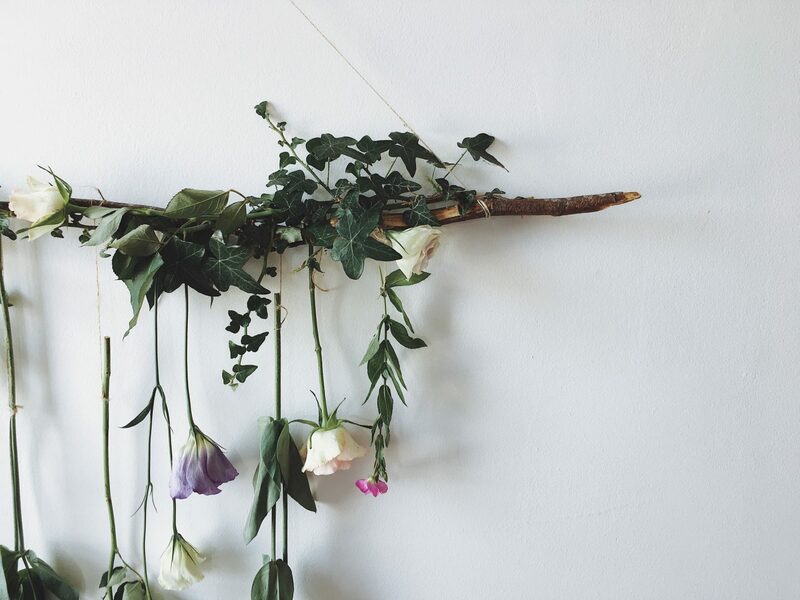 I then wove a couple of left over flowers through the ivy and twine, along the stick. Finally, I tied a longer length of twine to each end, ready to be hung on the wall. If you are thinking of making this for a party or a wedding, then it might be a good idea to choose your flowers carefully. 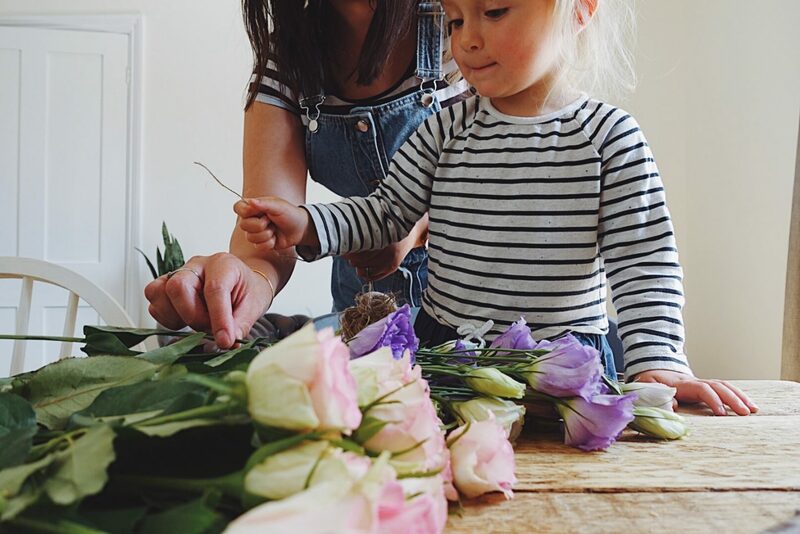 Certain flowers will wilt more quickly than others, so if you would like the display to look pretty all day, then think about choosing hardy varieties of flower. So there you have it. Told you it was easy peasy! Make sure you tag me in your creations if you decide to have a go yourself. I would love to see them. This is beautiful Kerry, looks so pretty! x PS Loving your new blog, v nice! I love this! 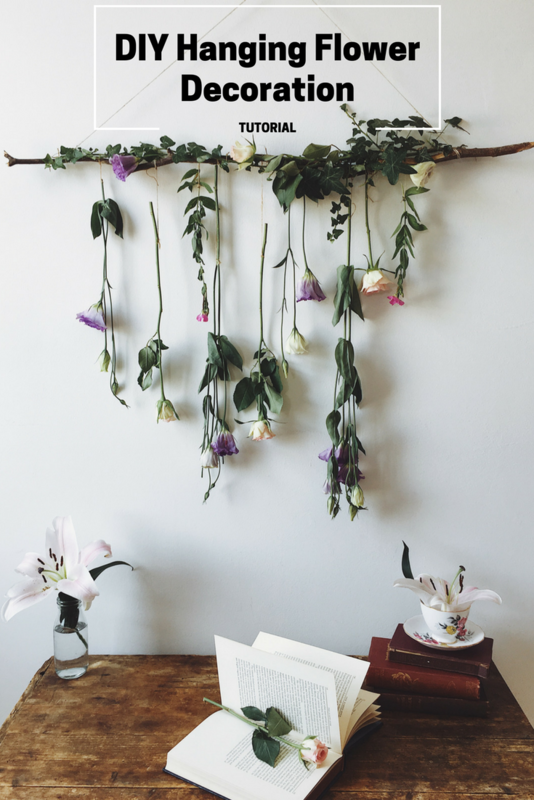 It’s so pretty and I’d love to have a go (though I have a feeling my husband would do an impressive eye-roll at the sight of it appearing in our kitchen or living room). I absolutely love this what a beautiful piece to make for your home. I need to try this when I get back. Love this style. 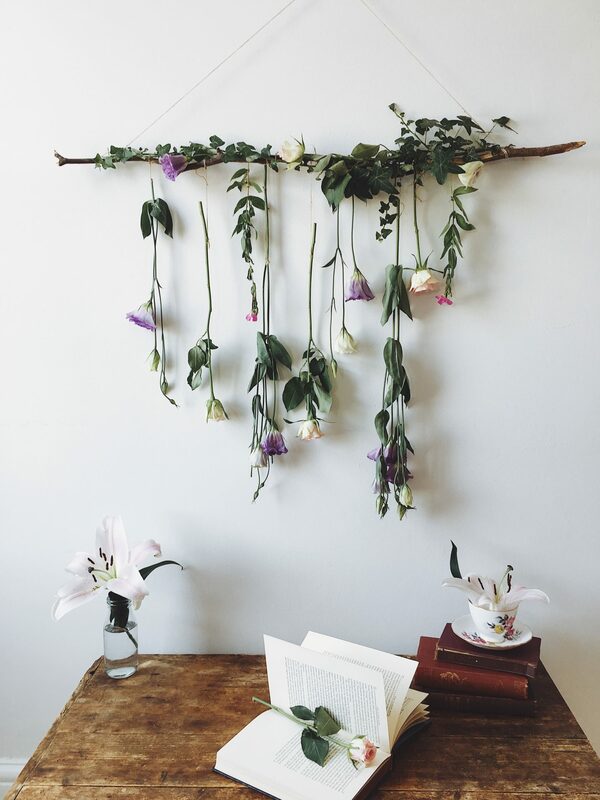 I just love hanging flower decorations! Thanks for the great tutorial.